The Department of Defense today announced the deaths of two soldiers previously listed as “Missing-Captured” while supporting Operation Iraqi Freedom. Jimenez and Fouty were part of a patrol that was ambushed by enemy forces south of Baghdad on May 12, 2007. They were assigned to the 4th Battalion, 31st Infantry Regiment, 2nd Brigade Combat Team, 10th Mountain Division (Light Infantry), Fort Drum, New York. The Department of Defense previously announced the names of soldiers killed in the attack. They were Private First Class Joseph J. Anzack, Jr., 20, of Torrance, California; Sergeant First Class James D. Connell, Jr., 40, of Lake City, Tennessee; Private First Class Daniel W. Courneya, 19, of Nashville, Michigan; Corporal Christopher E. Murphy, 21, of Lynchburg, Virginia; and Sergeant Anthony J. Schober, 23, of Reno, Nevada. If you have questions concerning the 10th Mountain Division (Light Infantry), please contact Mr. R.D. Murphy at (315) 772-5461. The Public Affairs Officer assisting the Jimenez family is Mr. Harry Sarles, Office of the Chief of Public Affairs, New York, at (646) 639-7496. The Public Affairs Officer assisting the Fouty family is Major Dawn Dancer, Michigan National Guard, at (517) 896-0860. If you have questions concerning the status change, please contact Shari Lawrence, Deputy Public Affairs Officer for the U.S. Army Human Resources Command in Alexandria, Virginia, at (703) 325-8856 or (703) 946-0791 (cell). Newly-identified remains of two soldiers from Massachusetts and Michigan who were killed in Iraq will be buried together. 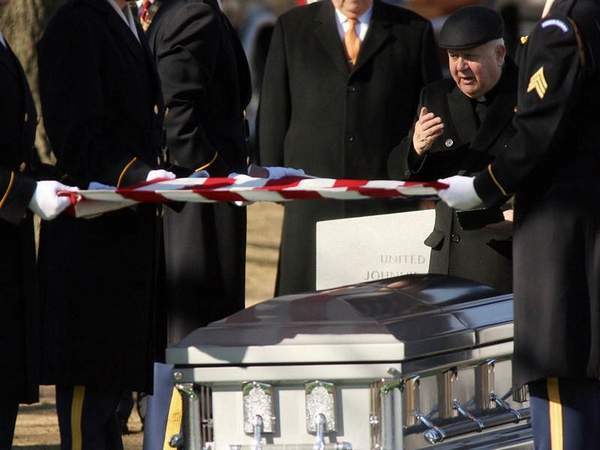 The Army says the remains of Staff Sergeant Alex Jimenez of Lawrence, Massachusetts, and Specialist Byron Fouty of Waterford, Michigan, will be buried February 17, 2009, at Arlington National Cemetery with full military honors. Sherry Lawrence, human resource commander for the Army, says the remains aren’t new, but could not be identified until now. Jimenez and Fouty of the 10th Mountain Division were captured in a May 2007 ambush. Their remains were found in July 2008. 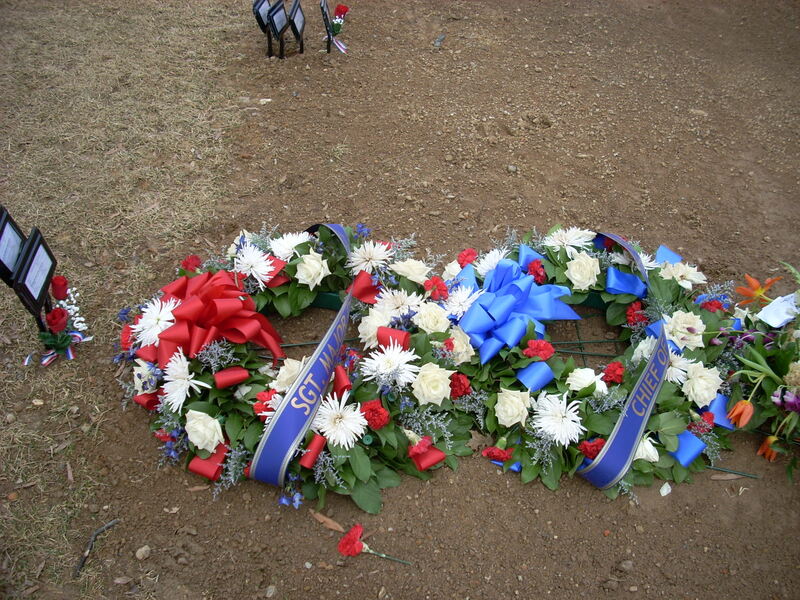 Jimenez was buried in Long Island National Cemetery in Farmingdale, New York, and Fouty was buried at Fort Sam Houston National Cemetery in Texas. Those remains will not be disturbed. They served together and died together. 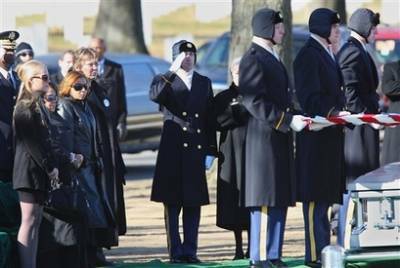 Now, two soldiers captured and killed in Iraq will be buried together in Arlington National Cemetery in Virginia next week. Specialist Byron Fouty of Walled Lake, Michigan, and Sgt. Alex Jimenez of Lawrence, Massachusetts will be buried together with military honors, including the playing of Taps and a three-rifle volley. 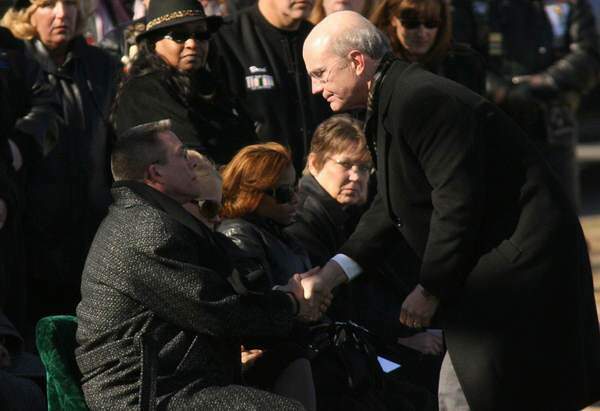 Fouty's stepfather, Gordon Dibler Jr., said Monday that family, friends and military personnel will be at the Arlington ceremony February 17, 2009. "This is just another way of mourning them and remembering them together," Dibler said. 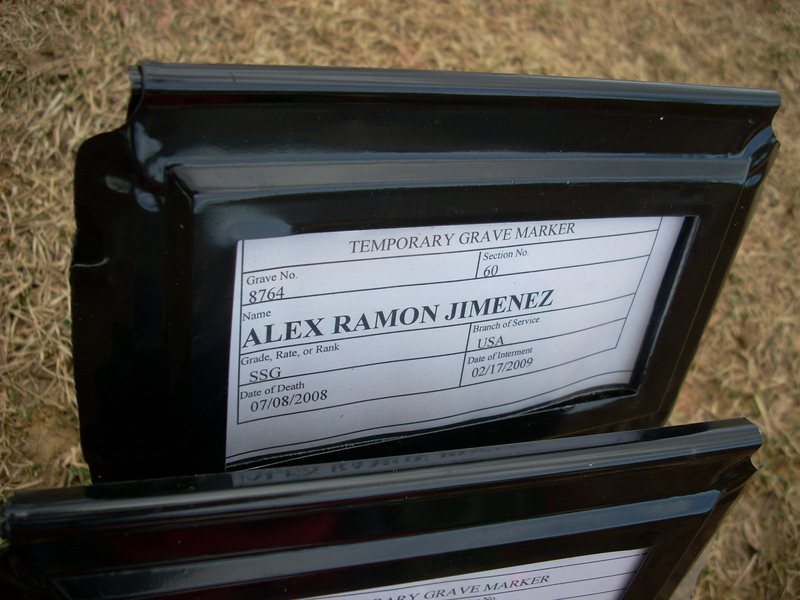 Shari Lawrence, deputy public affairs officer for the U.S. Army Human Resources Command in Alexandria, Va., said a portion of the remains of Fouty and Jimenez will be buried in a single casket with a marker denoting both names. Lawrence described the remains, which were found in July 2008, as skeletal. The two, both members of the 10th Mountain Division, were captured in an Al Qaeda ambush in May 2007 outside of Baghdad. Most of the men's remains were buried near their mothers' homes: Fouty in Texas and Jimenez in New York. 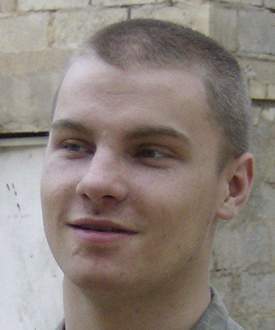 Fouty attended Walled Lake Central High School and enlisted in the Army in 2006. He was 19 when captured. 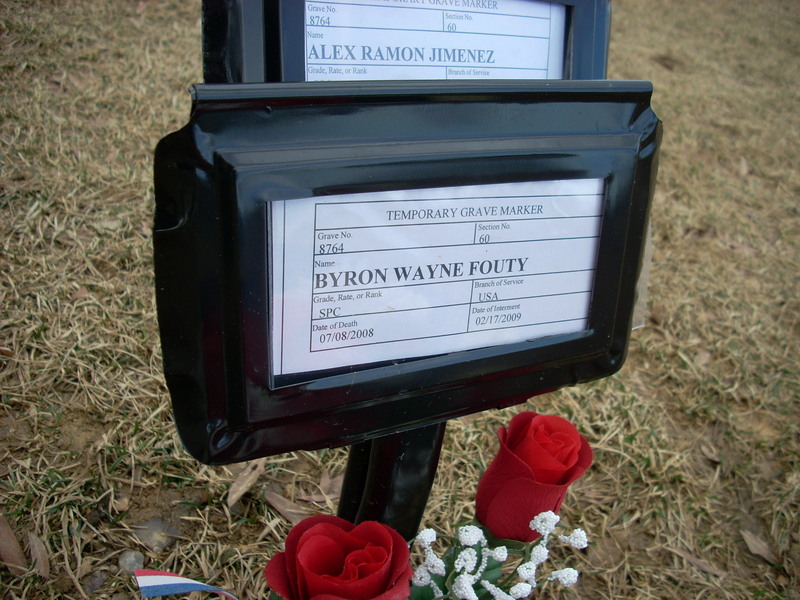 Remains belonging to U.S. Army Staff Sergeant Alex Jimenez and Specialist Byron Fouty will be buried together February 17, 2009, in Arlington National Cemetery in Virginia. The remains were discovered in a shallow grave in Iraq on July 8, 2008. The two soldiers were captured by terrorists in a May 12, 2007, ambush in a section of Iraq called the Triangle of Death. 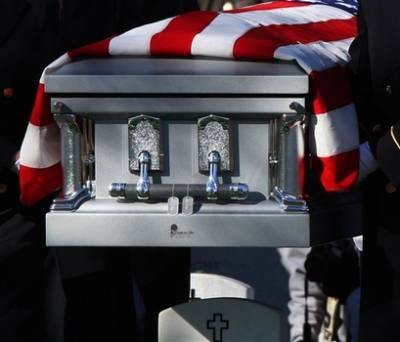 The remains that could be identified as belonging to Jimenez were buried in a cemetery near his mother's house in July, while those identified as belonging to Fouty were buried in Texas. 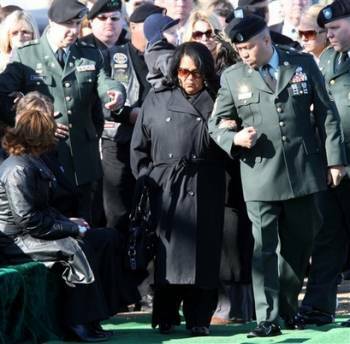 Public Relations Officer Shari Lawrence of the U.S. Army Human Resources Command said remains found in the grave that could not be directly identified as Jimenez's or Fouty's will be commingled in a casket and buried February 17. Lawrence said an Army blanket is set in the casket, with pieces of cotton laying on it where the soldiers' remains are placed. They are then covered by a white sheet, and the blanket is folded over it. 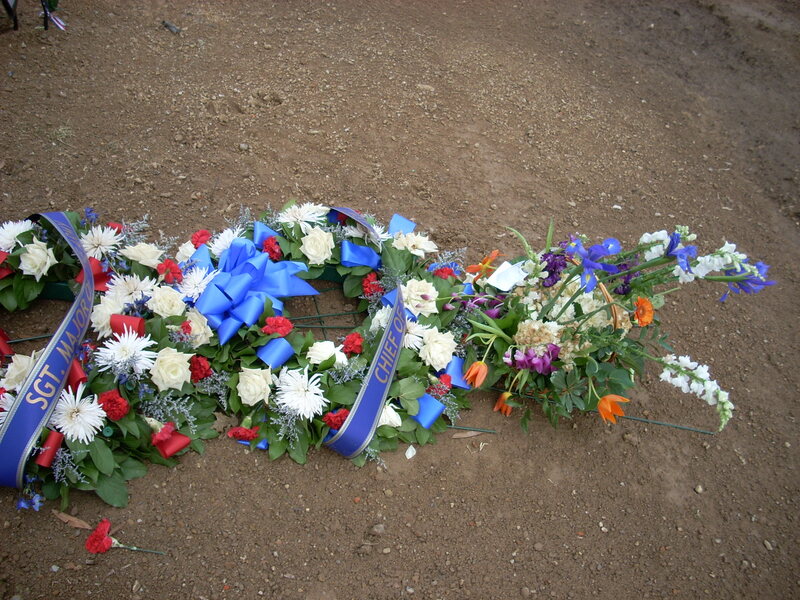 A replica of the uniform Jimenez, who had a higher rank than Fouty, would have used for official functions is laid on top reflecting his medals and rank. The remains of Private First Class Byron Fouty of Walled Lake will be buried with those of Staff Sergeant Alex Jimenez of Massachusetts at Arlington National Cemetery in Virginia on Feb. 17, said cemetery representatives. The two were captured in an ambush near Mahmoudiya, Iraq on May 12, 2007. Their remains were found together more than a year later in the Iraqi town of Jurf as Sakhr. Fouty was 19. He attended Walled Lake Central High School. 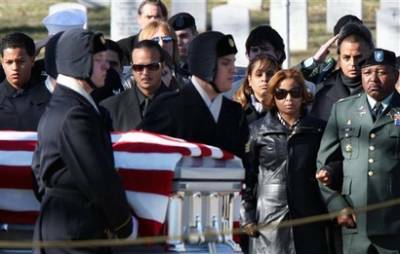 When the remains were recovered, the Army had offered an Arlington burial, but both families preferred instead to have their sons buried near their mothers' homes. 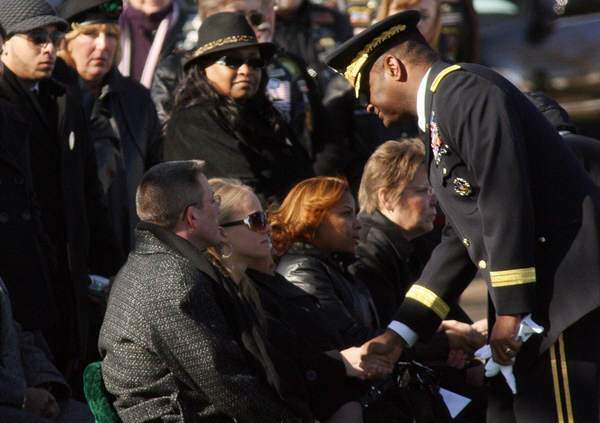 The Army will bury partial remains found at the site that analysts have not been able to accurately identify as belonging to which soldier, said Kaitlin Horst, spokeswoman for the Arlington Cemetery. The remains will be placed in a single casket and buried with full military honors, including military pallbearers and a three-rifle volley. 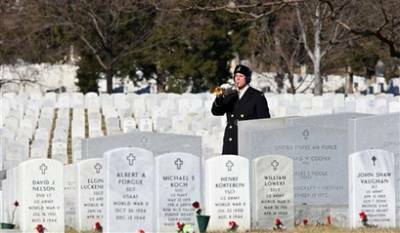 Buglers will play Taps, and flags will be folded and presented to the families. In July, Fouty's identified remains were flown to Michigan, where the soldier's passing was honored at a service at a Novi church. 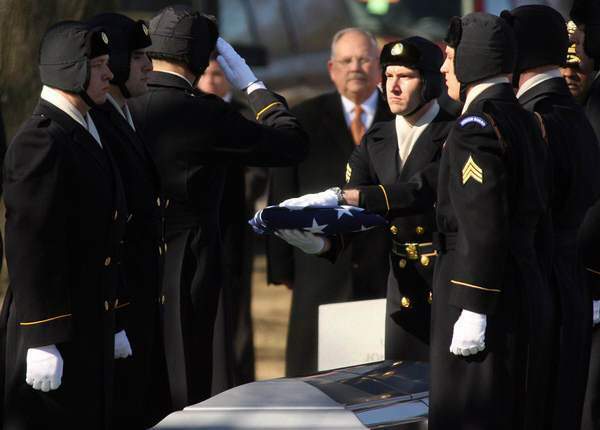 Members from the unit in which Fouty served, the 10th Mountain Division out of Fort Drum, New York, served as pallbearers and color guard. 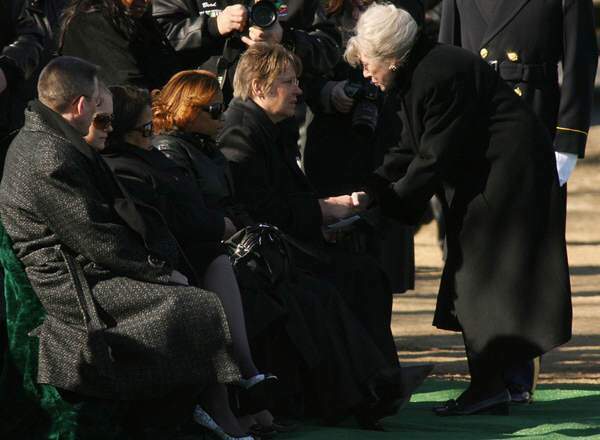 Days later, Fouty was buried at a private service near his mother's home in Texas. Jimenez was buried in New York. 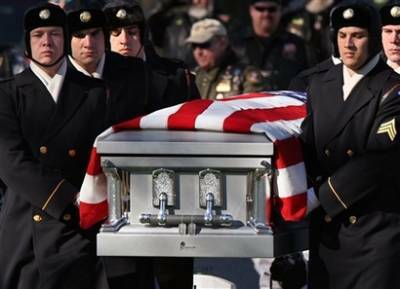 The single casket will be interred at Section 60, an area for military casualties from Iraq and Afghanistan. The cemetery receives about 10 percent of total causalities from both wars there. Among those attending the service will be Fouty's former stepfather, Gordon Dibler Jr., and Fouty's half-sister, Sarah Dibler, 16, and her baby son, Isaac. The family lives in Oxford Township. On May 12, 2007, an Army patrol south of Baghdad was attacked by enemy forces using automatic fire and explosives. When the fighting was done, four U.S. soldiers were dead, and three were missing. The body of one missing soldier was found in less than two weeks, but the search for the other two lasted almost 14 months before the remains of Specialist Byron W. Fouty, 19, and Staff Sergeant Alex R. Jimenez, 25, were located and identified in July. 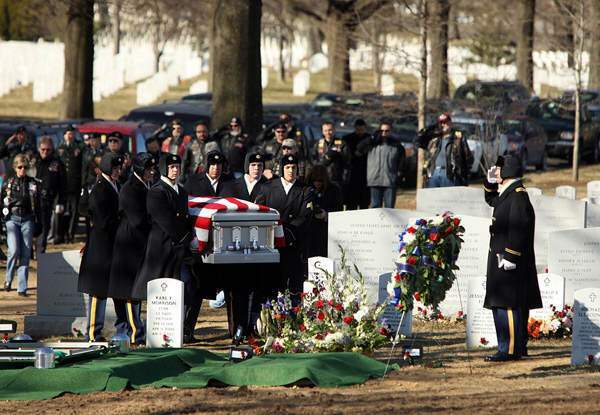 The two soldiers had separate burials last summer -- Fouty in San Antonio and Jiminez in New York -- but their long journey did not come to an end until yesterday, when remains that could not be positively identified received a group burial in Arlington National Cemetery. 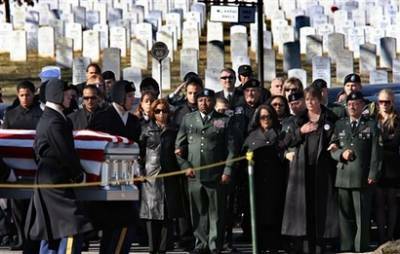 More than 70 mourners gathered in Section 60 of Arlington to say goodbye to Jimenez and Fouty. 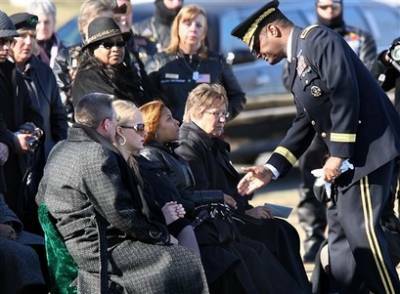 Relatives seated at the front of the assembled mourners received condolences from military officers and officials. 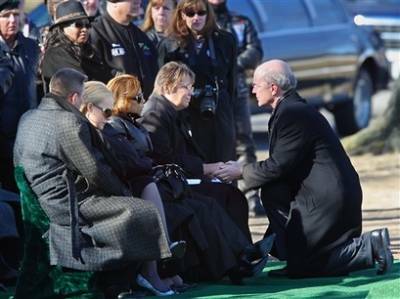 Secretary of the Army Pete Geren, a regular presence at Arlington burials, knelt to speak to Fouty's mother, Hilary Meunier, and Jimenez's wife, Yaderlin Jimenez. "It's a very sad relief," Fouty's stepfather, Gordon Dibler Jr. of Oxford, Michigan, told The Washington Post in July. "We rehearsed this every day, every scenario I could think of on how he would come home. This is not what we wanted, of course." During Jimenez's funeral Mass in Lawrence, Massachusetts, in July, his father talked about a letter Jimenez had written as a teenager asking for information about joining the Army. The letter spoke of wanting to make a difference by helping the innocent. "We are witnessing part of that letter. The whole world knows about Alex. He wanted everybody to know about him and he wanted to make a difference, which he did," Ramon "Andy" Jimenez said, according to the Eagle-Tribune newspaper in North Andover, Massachusetts. The patrol's mission May 12, 2007, was to prevent the enemy from placing roadside bombs in an area of Al Taqa known for the devices. The seven U.S. soldiers who ultimately died as a result of the attack were assigned to the 10th Mountain Division, based at Fort Drum, New York. The four U.S. soldiers killed in the attack were Sergeant First Class James D. Connell Jr., 40, of Lake City, Tennessee; Private First Class Daniel W. Courneya, 19, of Nashville, Michigan; Corporal Christopher E. Murphy, 21, of Lynchburg, Virginia; and Sergeant Anthony Schober, 23, of Reno, Nevada Also killed in the attack was an Iraqi soldier, Sabah Barak. The search for the three missing soldiers began immediately. The search involved dogs, trucks with speakers, unmanned aerial vehicles, law enforcement advisers and helicopters that dropped leaflets offering rewards for information, according to the public affairs office at Fort Drum. More than 4,000 U.S. and Iraqi soldiers took part in the search. Less than two weeks later, the body of Private First Class Joseph J. Anzack, 20, of Torrance, California, was found in the Euphrates River several miles from the ambush site. At least two soldiers were killed during the search: Sergeant Steven M. Packer, 23, of Clovis, California, was killed May 17, 2007, while on dismounted patrol near Rushdi Mullah; and Private First Class Matthew A. Bean, 22, of Pembroke, Massachusetts, died of wounds suffered May 19, 2007, when his patrol came under small-arms fire near Lutifiyah. On June 4, 2007, a video allegedly showing the two missing men's military identification badges appeared online with a narrator saying the soldiers were dead. The soldiers' remains were recovered July 8 after Special Operations Forces on July 1 captured an individual who provided information that led investigators to the site several kilometers west of Jurf as-Sakhr, according to Fort Drum. The Defense Department announced that the Armed Forces medical examiner had positively identified the remains July 10, 2008. The next day the Defense Department announced the deaths of Jimenez and Fouty. 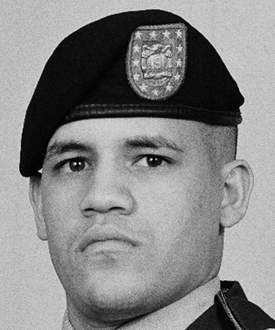 Jimenez, of Lawrence, Massachusetts, had served a previous tour of duty in Iraq from June 2004 to June 2005. He and Fouty, of Waterford, Michigan, deployed to South Baghdad with their unit in August 2006. Yesterday, the two soldiers joined Anzack, Connell and Murphy, all of whom were previously buried in Section 60. 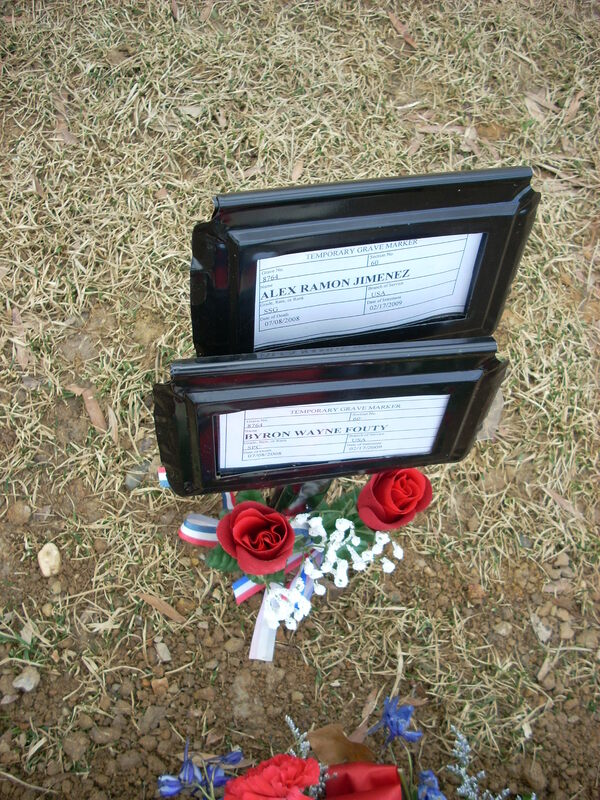 Fouty and Jimenez were the 453rd and 454th casualties from Iraq buried at Arlington. Shari Lawrence, deputy public affairs officer at Army Human Resources Command, said that the remains found in July were positively identified as those of the two soldiers but that some remains could not be identified as belonging to either. 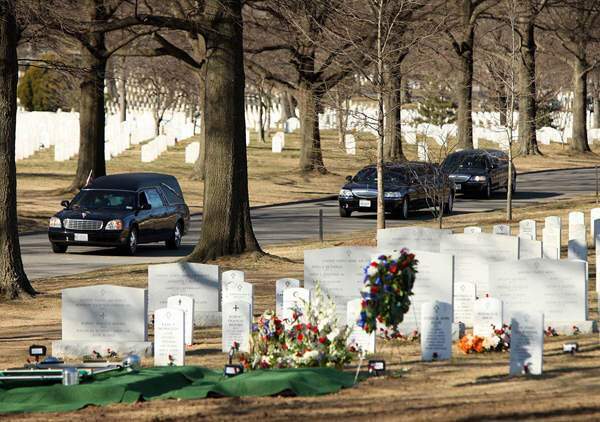 When remains cannot be individually identified and group burials are held, they tend to be held at Arlington, because it is "hallowed ground" for all Americans, she said. National Cemetery Tuesday, February 17, 2009. U.S. Army Specialist Byron W. Fouty and Staff Serrgeant Alex R. Jimenez on Tuesday, February 17, 2009. 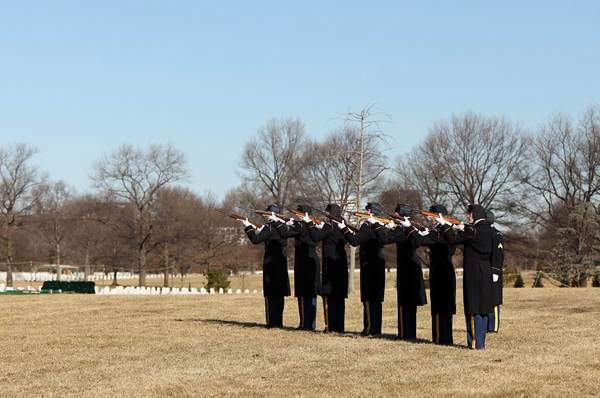 One of three volleys is fired by a firing party at a group burial service at Arlington National Cemetery for U.S.
Army Specialiat Byron W. Fouty and Staff Sergeant Alex R. Jimenez Tuesday, February 17, 2009.